The global energy scenario has been experiencing a tremendous change with shifting trends toward the adoption of green energy. 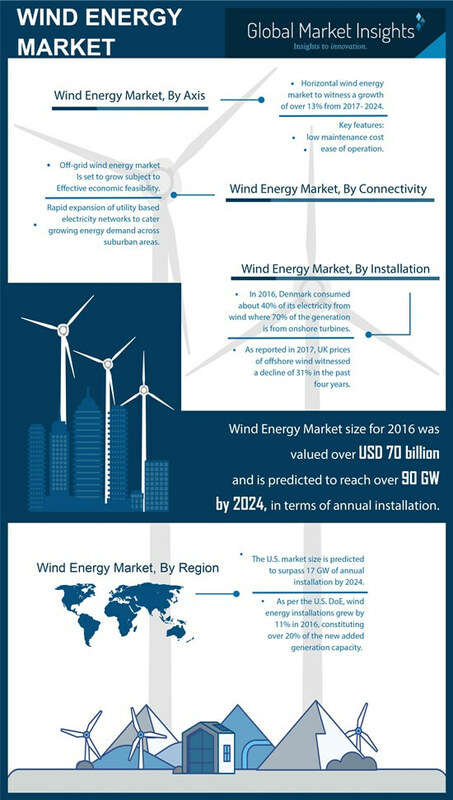 Wind energy market, currently one of the most trending business verticals, is a major recipient of this change. Since ages, fossil fuels had been primarily deployed for fulfilling energy requirements, however, their usage has been leading to increased GHG emissions, negatively impacting biodiversity and environmental safety. In consequence, most of the countries have increased their dependency on renewable energy sources for domestic as well as commercial applications, creating a favorable scenario for wind energy industry growth. The implementation of renewable power generation plants has also been contributing toward the generation of employment opportunities. The rise in the employed citizen base will undoubtedly prove beneficial for the economic growth of nation. Thus, renewables not only contribute toward clean power generation but also toward impelling the country’s economic progress, making wind energy market a rather viable investment ground. According to Global Market Insights, Inc., overall wind energy market size will surpass a revenue collection of USD 170 billion by 2024. With the legal acceptance of all the European countries with regards to increasing their dependency on renewable energy, the European Union has set myriad policies to curb the usage of fossil fuels. Most of the players in Europe renewable energy industry have also shifted their focus toward implementing highly advanced energy generation techniques and facilities, leading to a rise in employment across the European region. In addition, the EU has established a Renewable Energy Directive to encourage the adoption of renewable energy sources. For the record, it aims to accomplish 20% of its overall energy needs from renewable energy sources by 2020. EU member countries have been rather proactive with regards to contributing toward the overall wind energy market. For instance, in 2014, the German government provided sufficient funds to construct twenty offshore wind farms. The size of each wind power plant ranged from 252 MW to 668 MW – that is to say, the total energy generation capacity will help fulfill nearly 13% of Germany’s energy need by 2020 through this National Renewable Energy Action Plan. Merely a few years before, the Indian government initiated the ‘Make in India’ directive, through which it has been calling upon several investors to develop the renewable energy sector across India. Currently, India is counted among top five power generation countries. The nation is highly proactive in wind energy industry – in 2016, India generated about 27.44 GW of wind energy out of total renewable energy production of 44.81 GW. In addition, the Indian government is looking forward to adding 60 GW of extra power generation capacity via wind farms by 2022. The rise in the requirement of energy for a highly populous country is one of the major factors behind heavy investment in India renewable energy industry. Moreover, taking into account the escalating trends of urbanization, present economic growth, and growing per capita energy consumption, the Indian Renewable Energy Development Agency (IREDA) has decided to increase the dependency on renewable energy sources for fulfilling future energy demand, thus propelling the regional wind energy market. In another instance, the Indian clean energy promoter, Avaada Power, decided to invest INR 25,000 Crore in renewable energy sector to build wind and solar power plants in India over the coming four years. In order to encourage players in renewable energy sector, governments have also been providing 100% FDI for renewable energy generation and distribution projects. Say for instance, the Germany based firm Enercon and the Denmark based Vestas company have both invested in India to develop wind energy infrastructure. Growing investment opportunities such as these are slated to propel wind energy market outlook across India over the coming years. Recently, the South African government signed a deal with the DoE to implement 27 Renewable Energy Power Producer Projects (REIPPP). In order to optimize and mobilize all available energy sources, it has called upon various investors from across the continent. In addition, the government has been inking partnership deals with energy magnates to strengthen its dependency on wind power, thereby propelling the regional wind energy industry. In order to augment its wind energy industry, the Russian government recently carried out a survey for understanding the existing barriers and future opportunities in wind energy sector. The survey has apparently depicted that a weak regulatory framework and challenges related to grid connection are hindering the growth of Russia wind energy market. In addition, insufficient funding and lesser presence of investors have also been negatively impacting the national energy generation capacity. In consequence, the Russian government has updated its existing national directives in accordance with the modern IEC standards. The country has even been opening its domestic marketplace for foreign investors to develop wind power projects. The Russian government is seemingly looking forward to installing wind energy plants of 4.5 GW total power generation capacity. Indeed, it is expected that by overcoming its existing barriers, Russia will emerge to be a lucrative investment destination for wind energy market in the years to come. Recently, the Swedish energy company, Vattenfall teamed up with the French financial institute Caisse des Dépôts to build an offshore wind project in France. With the agreement, Vattenfall is likely to considerably strengthen its position in global wind energy market. A while ago, Transatlantic Power Holdings and Ardian teamed up to form Skyline Renewables, a renewable energy platform. Skyline has now acquired the U.S. based windfarm Whirlwind from Renewable Energy Systems Americas Development Inc., through which Ardian has successfully extended its presence across United States wind energy industry. Taking into account the adoption rate of wind energy technology across the globe, leading companies have been investing heavily to deploy more number of advanced facilities. For instance, GE Renewable Energy is planning to invest USD 400 million to develop and install a powerful offshore wind turbine over the coming five years. For the record, this turbine will generate 45% more energy than the present largest wind turbine. Apart from GE, Siemens Gamesa and MHI Vestas are also looking forward to launching advanced turbines in offshore wind energy market. This is likely to turn out to be an ambitious scale-up for other giants in wind energy market to invest in. The shifting trends toward increasing adoption of renewable energy sources as an alternative for fossil fuels are slated to generate novel opportunities by the day for participants in wind energy industry. Numerous changes have been paving their way in regional regulatory frameworks, increasing the dependency on renewable energies. Visualizing a carbon-free environment, regulatory organizations have been conceiving future policies regarding wind power plants by increasing its application scope. In the coming ten years, the social and economic scenario of renewables across the globe is poised to be highly diversified, which would provide a significant impetus to wind energy market size.